Voice of Hope Ministries is excited to host Sing! An Irish Christmas this year at the AT&T Performing Arts Center, Winspear Opera House. Keith and Kristyn Getty will be performing live in concert with their Celtic, Bluegrass, American and Classical Instrumentals. 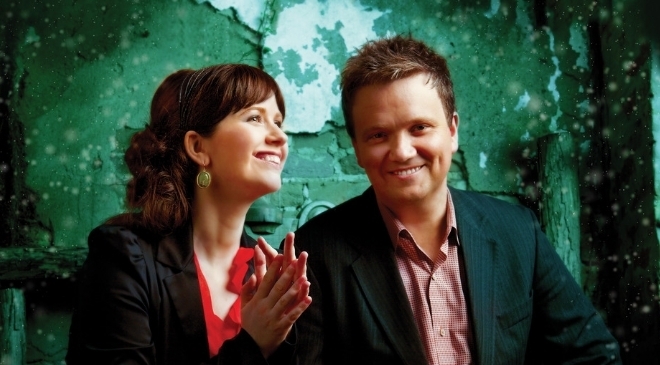 Come enjoy Christmas favorites, classic Getty hymns and new songs written by the Gettys. What a wonderful way to usher in the Christmas season with all your family and friends! “In Christ Alone” (penned by Keith and long-time writing partner, Stuart Townend) holds the #1 position of most-frequently-sung in UK churches for the past 9 consecutive years. It was voted the #2 best-loved hymn of all time in the UK according to a BBC Songs of Praise national survey and among the top 5 hymns of all time by the UK Hymns Society. According to CCLI, it is estimated that 40 to 50 million people sing “In Christ Alone” in church services each year— which does not include the unique reach the catalog has into traditional and classical contexts, as well as the popularity of the song throughout Asia. More than 60 of their songs are featured on top 2,000 CCLI charts between the UK and USA.